Will is completing his Level 2 Warehousing IPS Apprenticeship with The Glass Wipe Board Company and will conclude in February 2018. IPS caught up with Will to see how his Apprenticeship journey is progressing. 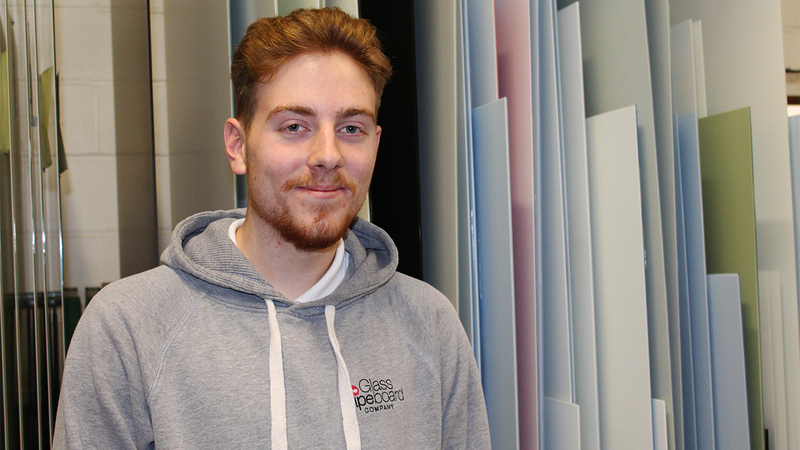 Will works in the warehouse handling the glass wipe boards, glass and packaging products, gaining new skills through his apprenticeship and support of his assessor. “I have been certainly enjoying the experience. I had previous Health and Safety knowledge through my electrician’s qualification, but by doing this, I have learned a lot more in-depth knowledge, like certain ways of handling from a safety aspect. My assessor also encourages Health and Safety by informing me of protecting my hands so I now use Barrier Cream daily which is cream to place a barrier between the skin and contaminants that may irritate the skin. Bev, my assessor, is supportive and if I don’t understand something, I know I can send her an email with my questions, and she comes back with a quick response rate instead of waiting until the next visit. Bev is brilliant with appointments and is very accommodating, she makes sure it’s always convenient with the company and when she visits, Bev emails myself and my manager to confirm dates in advance. Just recently, we had a reduced workforce due to holidays and sickness and I had to step in to assist, which led to us having to change Bev’s visit at short notice but she rescheduled for us with no problem. “In the first month of my apprenticeship, Bev gave me information, advice and guidance on how to progress into a managerial role and if I wanted to learn more in warehousing to carry on with a Level 3 qualification. For now, I’m happy to stay at Level 2 but I’m willing to gain further education and explore this when complete. My goal is to progress within The Glass Wipe Board Company as I enjoy it here but I feel my next step would be going into fitting of the product and going out and meeting customers. To do this, I’m interested in upskilling myself to benefit me in my career goals and so am thinking a Customer Service qualification next? IPS wish Will all the best in the future and we hopefully look forward to seeing you on a Customer Service qualification soon!